I am a NY Times best selling author, and five time Fit Body Boot Camp owner living a life of service and impact earning 525k in net personal income by October 10th, 2020. I guess I misunderstood slightly. The assignment was repeat the 1 sentence summary of our current Definite Major Purpose for 50 minutes. For one hour, taking breaks to sip some fluids I repeated the sentence above. I was pretty sure I was forgetting a word here or there. I was using the flashcard. I was repeating it from memory. By the end though it seemed inevitable. How can all of this possibly not happen? I think that was the point of the assignment. To train ourselves to be so totally bought in to what it is that we want that it becomes necessary for behavior and attitudes to align to bring it about. All I can think is “Don’t believe us just watch”. This is happening all around the world with the Master Key Experience. People are setting their minds on a course and DOING it. Our guide said, “people are worried about not doing it right and not ever having a ‘perfect’ week”. I don’t know that I have successfully executed every thing on my lists every day in any singular week BUT I have done well. I have had some ups and downs but I am progressing. I have noticed improvements and I’m getting better. I find myself to be way happier and more positive and I’m telling people confidently and expectantly about my 2020 vision and major purpose. Make a rectangle and then change the color and then fill it and hen make it a different color. Week 10, we practice concretely visualizing a thing and then changing it in the theater of the mind. Awesome. I noticed that it is harder for me to create a yellow rectangle. I great this day with love in my heart. Everything in our reality is the result of what we have thought. We create our realities with our thoughts. I’m focusing on positive thoughts because the world within determines my world ‘without’ or my external reality. You mean I can determine how great my life is simply by being disciplined with my thoughts and consciously practicing visualizing what I desire? And why yes, I will also aim to spread this joy, love and Abundance. I’m thoroughly enjoying reading the Gal in the Glass at night. It was invigorating to read my DMP to Beethoven’s Ode to Joy. I like listening to it. It gets me pumped up and I can’t help but feel goosebumps and excitement. Imagining a conversation with a dear friend in which I tell her about the successes we are having not only at the studios but also with the books is becoming easier and easier. The 7 day mental diet, well, that’s a totally different story…I have not yet made it past noon on the mental diet. 😦 I am hoping that it will continue to get easier and easier. So this is starting to be kind of fun. Don’t get me wrong, I have enjoyed parts up to this and what we are doing is resonating but NOW I am really enjoying this. Yesterday I recorded my DMP (version 1.0, because I know it is going to evolve and expand) to Beethoven’s Ode to Joy. I got goosebumps. I love it. It was incredible repeating my vision aloud to this music. I felt how I feel when I accomplish MY goals. On another note, the refraining from giving opinions is hit and miss. The 7 day diet, well I’m back on day 1. But I see how it all ties in and I like it. 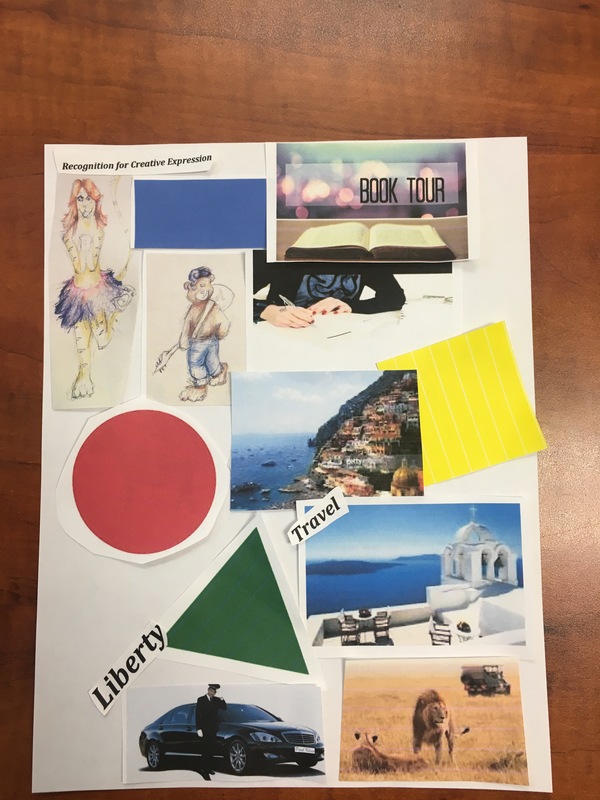 Week 6, began with a webinar where we learned even more about how are shapes can be connected to our Personal Pivotal Needs. This week we got to switch to scroll #2 in Og’s Greatest Salesman in the World. I’m absolutely LOVING (no pun intended) the second scroll. I’m not sure if I’m seeing things translate into concrete realizations of my goals yet, but I do feel like my goals are front of mind and I can clearly articulate what I want and by when. I feel proud of the work I’m doing.